Inspiration Diet, day one. Good. I agreed with myself that I can check email/ Facebook /Twitter/ Instagram/ Internet a total of twice today. I don't think social media is bad by any means. I think it's amazing and connects us and fun and best for ME when I use it in moderation. I'm not usually a moderation type of girl. EXTREME. But some days- when I'm so bored or so lonely I probably check 100 times. It made me lonelier and emptier and used up time I should have spent doing something to fill that empty hole within. Not make it bigger. I had a Doctor's appointment today and he was running 45 minutes behind. I sat in the waiting room, watching everyone else on their cell phones. Buzzing and dinging and ringing everywhere. Antsy me. Old people, young people, didn't matter- they were on their cell. I kept myself company. And once I got through the antsy, I was alright company to be in. The funny thing is- I need alone time. As in-- MUST HAVE or not okay. I need quiet and no thinking and no people and no small talk and just me. Daily. And I am remembering that alone time and lonely are two stark concepts. Quiet doesn't have to mean lonely. How did I forget? I'm working on feeling my feelings. I was the first person in my family to graduate from college. A feat that still shocks me just a little because I really had no idea what I was doing. I declared a major at the last possible second of the last possible day, Communications Management. Mostly because it required only one Economics course. My very last semester of school is when I decided what I wanted to be when I grew up. An Actor. My total of ONE- "Acting for the Non-major" course my last semester sparked a fire. One class, absolutely and no experience- why not? I had nothing else in the works. The fire the acting class sparked, the feeling I got on stage when the words would flow and I was absolutely someone else but still in my skin and all the words I never thought I would remember came flooding out as if I was thinking them in that moment- plus the fact that my Instructor wanted me to audition for local theater made me think I could do it. Besides, I didn't know what else to be when I grew up. My favorite aunt lived in New York City and taught acting by day and did commercial work on the side. She had always told me if I ever wanted to come to New York to act that I could live with her and she would help me get started. After 5 1/2 years I finally graduated school with of a half of a plan intact. I was moving to New York. My Aunt told me the first thing I needed to do was hire a professional photographer for head shots before I left. I lived at home with my parents and I didn't have a job. Who could afford a photographer? So I improvised. 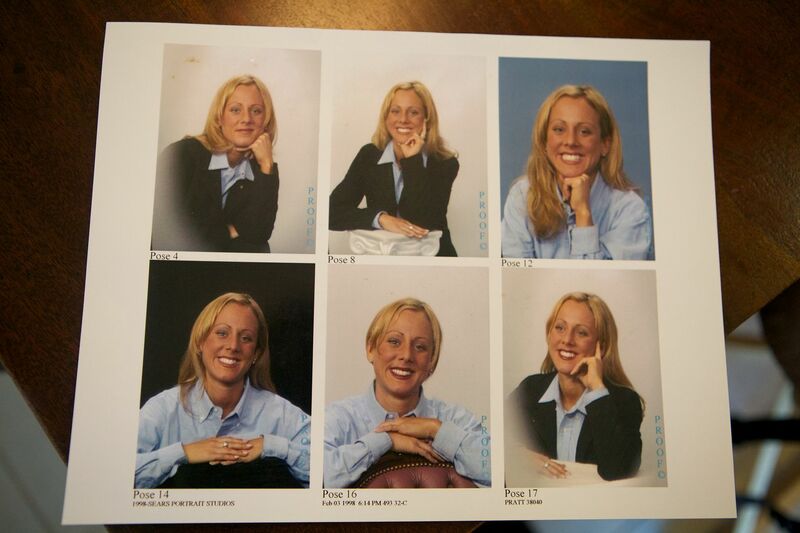 I went to Sears Fricking Portrait Studio. I remember even being PROUD of the results. Before I had them taken I remember buying a little boys sized Large Polo oxford because I thought it was nice and professional and I couldn't afford an actual woman's sized Ralph Lauren one. I added the jacket because it just really highlighted my versatility and range. Wouldn't you agree? Hands on or near face, 6 out of 6 shots. Super creative Sears. The photographer in me DIES when I look at this. And then dies laughing. And apparently I was boycotting eye brows at the time. I wonder how I was supposed to convey surprise without my eyebrows? My acting must have been that good. By the grace of God and luck my Aunt called me as I was planning my move with some disappointing news. She lived with her boyfriend at the time and they had discussed it and decided I could come stay for a week or two, but I couldn't live with them. I was crushed. I thought the World was ending. And I moved on. I moved into my own place. I bought my first car. I got an amazing job I LOVED in Entertainment Marketing. I frequently traveled. I experienced the World. I'm not all business but I'm certainly not an actor. This job was the perfect mix of both worlds. Life was amazing. And all of those things lined up has lead me to here. My on purpose life, picked out just for me. She may not have been smart or always practical, but I love that young girl called me that thought anything was possible in Life. Even acting with no training or experience in NEW YORK. She's still in there- covered under some goo and hard knocks and fear and adulthood. I must remember to look for her. She's the one who KNOWS she is changing the World for autism and everyone different. It also reminds me that sometimes those soul-crushing moments when we don't get what we want is an absolute blessing. I've spent so much time learning to ignore and smoosh down my feelings. Sometimes I need to ignore them to be productive and to be okay. But sometimes I don't even know what I know anymore. Am I hungry? Bored? Am I angry or over exaggerating? Am I restless? Am I sad or hormonal? Do I like that? Do I want that? I'm so glad I'm a stay at home Mom! I MISS work and using my brain and eating real food with a fork for lunch. So as part of my Inspiration Diet, Day two I am giving myself permission to get in touch with my real feelings. I am going to work to let go of the claw like grip I place on my routine. I am no longer writing Sunday through Thursday. I am going to write when I feel like writing. Maybe it will be 7 days a week. Maybe it will be 2. I want to write because I want to write, not out of imaginary obligation that I create. I have this fear, if I don't write, I won't look for inspiration. If I don't write, you won't like me- you will forget about me. If I don't write- I'm not doing the most I can for my boys. Although those feelings are real- I know they aren't rationale. What are you doing out of pure obligation that you deserve to stop? If you need permission- I am offering it to you. Put yourself first. Write about it. Get in touch with it. Give yourself permission to say No. Give yourself permission to say Yes. Give yourself permission to cry, call in sick, get a massage and feel what you really, really feel. Congratulations, Chrissy. I know I will still be here even if you realize you only enjoy writing once a week. I know you will bring a whole lot to the plate that one day (or however many you end up writing). Take this time for you and your soul and your boys. You are such an inspiration! Brilliant! my friend :) I agree and am so happy you are giving yourself the permission you need to stop living out of a sense of obligation and start engaging in what your heart wants. I have a lawn boy (my nephew) & a house cleaner (my sister). Neither work for free, but both are affordable. My husband & I now have time to do the things we love to do rather than the chores we "should" be doing. Mostly that amounts to being at the beck & call of our 4 year old. How lucky are we?! Isn't it awesome how life can look if we stop living according to expectation - ours or others? Love your blog, love your photos. Have you read The Spark by Kristine Barnett? I have a son with ASD. Very inspiring book---even for moms with typicals. Have a great day, Chrissy! I think those pictures are sweet - I find myself going back in time and rooting for you back then like I do today. Oh goodness! *Really* give myself permission to do what I feel? That is such a scary thought. I feel like all hell might break loose, LOL. I feel like I did that all through my 20s and it looked like lots of partying and lots of sleeping (did I mention LOTS of partying?) - and man, was that fun! Sure, I'm too old to recreate that even if I wanted to (how about I get a 2 day hangover from 1/2 glass of wine, so I dont even touch the stuff) - but even if I ... called in sick one day (I just.never.ever.do.it), or played hooky from work, or just said forget the kids' jam packed Saturday schedule, Mommy wants to watch some documentaries on Netflix ... or if I forgot about the budget (which I have created and imposed on my family) and just indulged ... what would that look like? I am afraid to even try. I know, control freak = fear. Perhaps by watching you take these steps, I'll be inspired to let go just a little bit. You definitely inspire me!